Take control of your investments with Wagner Financial Services LLC. There are no limits. Education brings opportunity. Expand your knowledge with Wagner Financial Services LLC. Wagner Financial Services LLC offers comprehensive solutions through a spectrum of financial services. 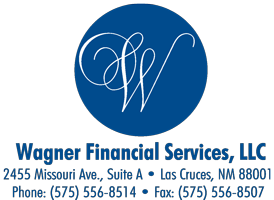 From growing your wealth to planning for your family’s future, Wagner Financial Services LLC is New Mexico’s preeminent investment advisor. Whether you are a veteran of success or are just starting to manage your portfolio, Wagner Financial Services LLC can help you achieve your goals and surpass them in time. One-size fits all policies are best left to vacation bike helmets. At Wagner Financial Services LLC, we specialize in tailoring our plans to not only fit your current situation, but also provide a foundation for future growth. No matter where you are in your financial journey, we endeavor to take you to the next level. Managing investments in your employer’s 401k program or in your own IRA can seem complicated, but Wagner Financial Services LLC will make it easy. A good defense is the best offense. Let Wagner Financial Services LLC surround you and your family with leading insurance policies. Whether you’re a party of one or six, Wagner Financial Services LLC customizes your investment strategies to fit your current needs and future goals.